Some of you will know I started working for Hemingway Design about this time last year and mostly I edit the Vintage Festival blog, run the Vintage Correspondent programme, organise the Vintage area at London Fashion Weekend and snap for the Instagram feed. Well, back in November my duties took another exciting turn when Wayne invited me to project manage their involvement in the Diamond Jubilee Festival which over time also developed into me curating all the fashion and beauty content for the Festival. 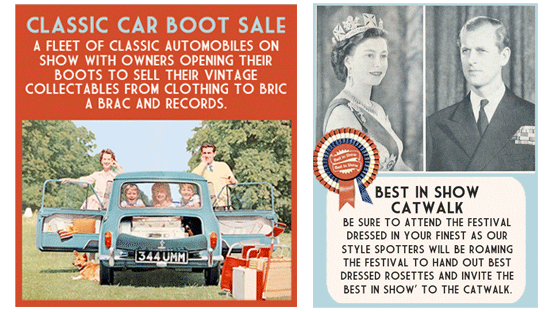 I’ve organised 3 marketplaces exclusively for the Jubilee – A Classic Car Boot Sale, A Right Royal Department Store and A Handmade Memorabilia and Vintage Collectibles Market. 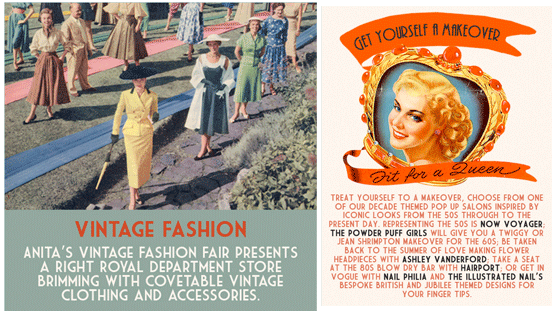 I invited Anita’s Vintage Fashion Fair to present the department store and Etsy to present the handmade market. Together we’ve gathered 36 of the most amazing stall holders dealing mostly in pieces which have been sourced or handmade specifically for the Diamond Jubilee. For the classic car boot I scoured the land for super cool vintage vehicles with owners who wanted to flog their bestest thrifty finds from their shiny boots. On the day you’ll be able to trawl fun vintage finds from a 50s citroen traction avant; a 60s porsche; a 70s capri; an 80s ambulance and many more! • The 50s Salon presented by Now, Voyager. Turn good or bad with a full makeover to either become a good girl debutante for the day or a bad girl rockabilly rebel. • The 60s Salon presented by The Powder Room. The Powder Puff Girls will transform festival goers into icons of the 1960s British Fashion Royalty like Twiggy, Jean Shrimpton, Mary Quant to name but a few, creating brilliant beehives and luscious lashes. • The 70s Salon presented by Ashley Vanderford. Relax with friends and family atop a vintage picnic rug and make your own Summer of Love Crown from an array of beautiful fresh flowers. • The 80s Salon presented by Hairport. Choose a hairstyle from the menu curated exclusively for the Jubilee: The Beatrice beehive, The Royal wave, Regal rolls, Duchess & Pearls, The Queens Guard or the The Crown Jewels. • The 00s Salon presented by The Illustrated Nail. Take a pew in the Royal Nail Bar and choose from a number of nail wraps designed especially for the festival. 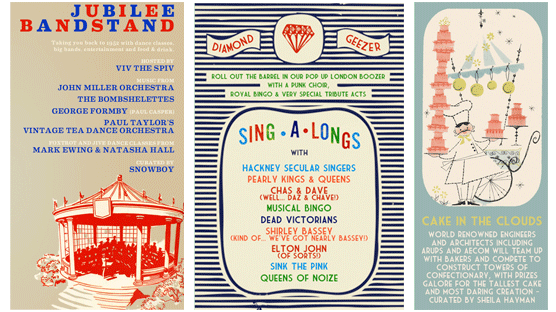 The festival also has a 1952 bandstand which will house swing orchestras and mass dance lessons; a Diamond Geezer pop-up London boozer (which I’ll certainly be rolling out the barrel in! ); the WI are bringing 1000 cakes that we can all scoff with a cuppa; an open air cinema which I’ve spent hours and hours in the BFI archives selecting the most fantastic vintage royal clips for (including a young Queen learning to knit no less); a main stage featuring my fave trio Kitty, Daisy & Lewis; a village fete; souvenir making workshops; A Right Royal Art School and at some point in the afternoon we will all STOP and do a mass toast to the Queen and play God Save the Queen on thousands of kazoos. Oh yes indeedy. That’s what I’ve been up to for the past 6 months! 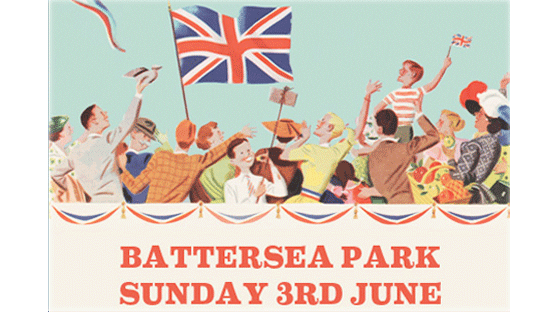 Hope you can join us in Battersea Park on Sunday 3rd June!!! It’s a ticketed event for safety reasons ‘n all but they’re only a fiver from HERE. All this work for a 1 day event seems pretty crazy, huh? It better not bloody rain, but then how totally traditionally British would that be! And the fate of Thrift-ola? After the Jubilee I’ll be working on the Vintage Festival which takes place on the 13th to 15th of July this year in the beautiful Boughton House and after that I’ll be back. Hurrah! Okay, you have the coolest job EVER! this is so amazing Leona, well done!